From 1978 to 1996, the Action Park of Vernon Township, New Jersey provided thousands of teenagers with the white-knuckle thrills only inattentive employees and poorly conceived amusement park rides can deliver. The Park's dubiously safe rides were responsible for countless scrapes and bruises and at least six fatalities. Half of these deaths were caused by drownings in the Park's wave pool. The other fatal accidents were the result of a head injury on a luge, a heart attack induced by cold water, and exposed electrical wiring on a kayak ride. 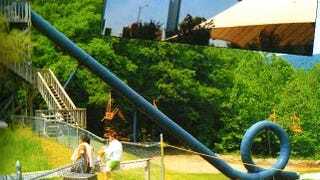 Despite the armada of lawsuits, safety citations, and injured children sent to nearby hospitals, Action Park trundled on for almost two decades, enticing patrons with sun, fun, and brushes with the Grim Reaper. There was however one ride that was too extreme even for Action Park. This water slide flipped the bird at physics so rudely that it was open for a single summer and then abandoned like a drainage pipe along the River Styx. We are referring to the infamous, gravity-defying Cannonball Loop. The Cannonball Loop was the brainchild of some Swiss guy they imported on a week-long visa. I was one of the idiots that accepted you-know-who's crisp $100 bill to test run it. That was my last ride. $100 did not buy enough booze to drown out that memory. If the rider got to the top, he (Again, the riders were mostly dudes. Read into that what you will.) suffered the final indignity of being sprayed with a garden hose. The top attendant then instructed the rider on the only acceptable ride position (on your back, feet first, arms folded across chest, ankles crossed), waited for the hatch attendant to check inside for any weirdness (cracks, water not flowing, etc), and then WHOOSH! Off they went. They made a godawful racket in there, with the bumping around and the screaming, but they always made it out alive, though no one was foolish enough to ride it a second time. I vividly remember the sensation of my feet going up as I realized "Here comes the loop!" I remember being ecstatic when I had cleared the pinnacle of the loop, however the worst was yet to come. Apparently my sub 100 lbs. body was not heavy enough for the ride and rather the sticking to the slide on the back end of the loop, I actually fell to the bottom of the loop. I smacked the back of my head on the slide and was nearly knocked unconscious. It was then I saw light as I sputtered out of the exit of the tube [...] I was able to orient myself enough to get to my feet and smile with pride as the stunned crowd cheered for the little kid who just went down the most dangerous water slide of all time. It was closed again within minutes and although I went to the park a dozen times after that day I never saw that slide opened again. The biggest problem is that sand and dirt and such would collect at the [bottom] of the loop and the people would start coming out with abrasions over their entire backs. Then they would have to close it down and clean it out. Those who survived the vortex were greeted not with a ticker tape parade but "a puddled wet mat instead of an actual pond or pool." Once it was closed down by fun-hating realists, the Cannonball Loop was not disassembled. No, it stood unused for all patrons to fear, like some entombed ancient god magically bronzed as a statue in a medieval town square, dreaming of a nosy archaeologist. To be fair to Action Park, the Loop had nothing on Victorian-era theme park conveyances. Via Weird NJ, Center of the Action, Domain of Death, and Coaster Guy. Hat tip to ProgHead777 for the suggestion.